Dar es Salaam — An air of resignation characterised reactions yesterday to the government's surprise ban on all genetically modified organism (GMO) trials in the country. Tanzania has been carrying out GM seeds confined field trials for maize in Makutopora in Dodoma Region and for cassava at the Mikocheni Agriculture Research Institute in Dar es Salaam. The trials in Makutopora by Tari started in 2016 and were at an advanced stage of release of the results for demonstration while the one in Mikocheni was ongoing. The Wednesday's move by the government, the researchers argued, will setback by over a decade efforts in the country to advance in biotechnology. Tari applied for approval of the Makutopora trials in 2010 but were allowed to proceed five years later, with the research window running out in 2022 when Cotton was expected to have come on board. Ministry of Agriculture permanent secretary Mathew Mtigumwe revealed the government's decision in a brief statement on Wednesday in Dodoma. According to the statement, the government was unhappy that Tari appeared to release field trial results without prior approval by other authorities. "Tari has recently invited various groups to Makutopora centre to witness its research findings when the government is yet to approve use of GM products in the country," said Mr Mtigumwe. Among several groups, the Parliamentary Committee for Agriculture was the latest to tour Makutopora centre where members, including former Trade minister Mary Nagu praised the results that the research had attained. Committee chairman Mahmoud Mgimwa said during the visit that they will lobby the government to adopt the GM seeds and allow its use locally to solve maize production challenges. For her part, Dr Nagu said critics of GM technology were politicising the matter while Tari director general Godfrey Mkamilo asked the government to give a go-ahead for other GMO trials across the country. Yesterday, however, newly appointed Agriculture minister Japheth Hasunga told The Citizen in a telephone interview that Tari had contravened government approval procedures. "They were supposed to give my ministry the findings which in turn would have consulted with other ministries to satisfy ourselves that the said GM seeds were safe and did not carry any risks to humans," he said. The minister noted that the Tanzania Seeds Certification Institute was also supposed to examine the seeds and recommend the way forward. However, speaking on conditions that they were not named in the media, some researchers expressed surprise that a technical misstep had been used to undermine all the efforts that have gone into GM products research in Tanzania. Tanzania planted its first genetically modified drought-tolerant GM maize in 2016 but the crop was destroyed because the country was yet to put up a policy on commercialisation of the seeds. Its second trial was for drought and insect tolerant maize seeds and was expected to be completed by the end of the year but will now be destroyed on the fresh government orders. Some researchers used their social network groups to express their disappointment over the development, saying their hard work will go down the drain. "If the order is from above, we need to be patient and wait for the official letter," wrote one of the researchers. "Science is about facts and figures and nothing else... .truth could not be changed into something else," he said. Another researcher said the public was not fully aware of the fact that the GMO seeds were on trial and were not yet commercialized. "The results would have enabled the country know whether the seeds were risky for human consumption or not but because they have been suspended the country would forever remain in the dark." They experts noted that Tanzania currently imports cloths from countries that use GMO to grow their cotton. "Tanzanians need to be patriotic on all fronts and not be only sensitive one way," he suggested. that GMO seeds will deny farmers the right to choose the kind of seeds they wanted. He feared that GMO seeds will wipe out traditional seeds and make farmers dependent on foreign seed merchants. 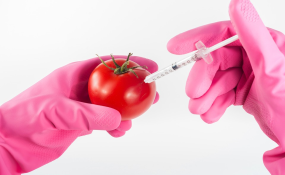 The Commission for Science and Technology (Costech) recently said GMO researches were as per policy that aims to ensure Tanzania benefits from biotechnology advancement. The country's agriculture policy of 2013 highlights the safe use of biotechnology to improve crop production. Environmental Management Act (EMA Act, 2004) also stipulates the safety use of biotechnology.